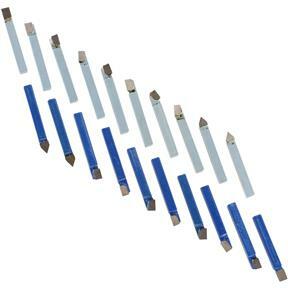 Carbide-Tipped Tool Bit Sets - 1/4" 20 pc. Grizzly G9775 - Carbide-Tipped Tool Bit Sets - 1/4" 20 pc. An exceptional value for carbide lathe tool bits! Twenty-piece set offers tremendous savings over bits sold individually, plus every type is duplicated and ready at hand when you need it. The carbide is C-6 grade for cutting steel and alloys.